Disclaimer of medical knowledge on any posts of a medical nature.These are the opinions from the author’s research. They are not necessarily my own opinions, nor are they medical facts by me. I am not a physician and do not claim to know the validity of this post. Many of us take water for granted. Sometimes we forget how lucky we really are. Considering water is such a vital resource, it’s important to consume enough. Are you drinking enough water? If not, how come? Many individuals find the taste of water boring, as it lacks flavor. If this is the case for you, don’t be shy to add some lemon to your next glass of water. Lemon is a highly beneficial addition, as it boosts your overall health. Not only will you be consuming essential amounts of water, but you will also increase the overall benefits that your glass of water provides. Although we are overfed, many people are deficient in a wide variety of nutrients. This has led to a population with highly acidic bodies, creating a wide variety of conditions. In order to maintain optimal health, your blood needs to be slightly alkaline. This of course means that our pH needs to be slightly above 7. The pH of water in its purist form is 7. Any pH below 7 is considered acidic and humans will stop functioning at a pH level below 6.8. The average pH of human blood falls between 7.35 and 7.45. Lemons are thought of as acidic, yet they have an alkalizing effect on our body. Bottled water companies are beginning to offer high pH options in an effort to appeal to those seeking an alkaline aid. However, these bottles typically cost $3 per liter or more, which is somewhat ridiculous considering the pH benefits and economics of putting some lemon in your tap water. Lemon water can help stabilize the pH of your body, preventing various health conditions. Since lemon water has a positive effect on pH levels, it helps the body remove toxins. This natural detox process is incredible for fighting off viruses and many other related ailments (especially regarding your long-term health). When you consume lemons, you’re providing your body with high levels of vitamin C. This antioxidant is essential for a healthy immune system, reducing the risk of any infections. The vitamin C from lemons also targets inflammation, making it a great addition to anyone suffering from inflammatory conditions like asthma. That’s correct, the amount of water and lemon you consume, will have a direct impact on your skin. The vitamin C found in lemon, helps target free radicals. The damage caused by free radicals can contribute to skin aging appearance. When you increase your intake of antioxidants, you’re essentially fighting off free radicals. In terms of your skin, this helps reduce the look of wrinkles, while maintaining beautifully clear skin. Lemon water has long been used as a liver stimulant, eliminating toxins from the blood. This process helps skin stay clear of blemishes. Considering our brains are made up of approximately 75% water, it’s important to drink enough each day. When you add lemon to your water, you increase the benefits even further. The potassium that is found in lemons, enhances nerve cells. In turn, this helps increase levels of concentration and memory, while producing a calming effect on the mind. Detoxing and cleansing your body is very important for optimal health. We consume various toxins from the foods we eat, the pollution we inhale, and the stress we endure. As mentioned, lemon aid in liver detoxification. When you drink lemon water, there is an increased production of bile. This not only helps detoxify, but boosts digestion. It also helps control the flow of bile, ensuring that the stomach is protected (preventing ulcers). Lemon water helps kick your liver into high gear, as it removes toxins at an optimal level. In terms of detoxifying effects, the same occurs within the gallbladder and kidneys as well. 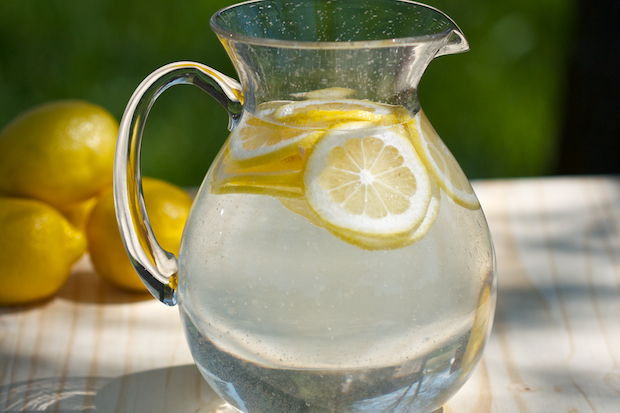 If you suffer from kidney stones for instance, lemon water can potentially help. Cell regeneration is essential for healing. When you are healthy, you’re able to heal more effectively. Vitamin C is vital for cell regeneration, which is why lemon is such a great healing tool. When you continuously supply your body with vitamin C, you ensure healthier skin, teeth, bones, and joints. Although the body heals naturally, added vitamin C can give it that extra boost. Losing weight can be a challenging process. The foods you consume will have a direct effect on your weight-loss goals. In order to curve cravings, lemon water is a great solution. When you drink lemon water, you not only curb hunger, but you feel satisfied for longer periods of time. Instead of mindlessly snacking between meals, drink more lemon water. This entry was posted in From Trusted News Paper And Other Types Of Articles And Videos, Important Things To Know, Interesting Food and Other Facts, Medical, Natural Remedies, Other People's Experiences by bonnie. Bookmark the permalink.